Image: Bubbles, the missing Space Amoeba. 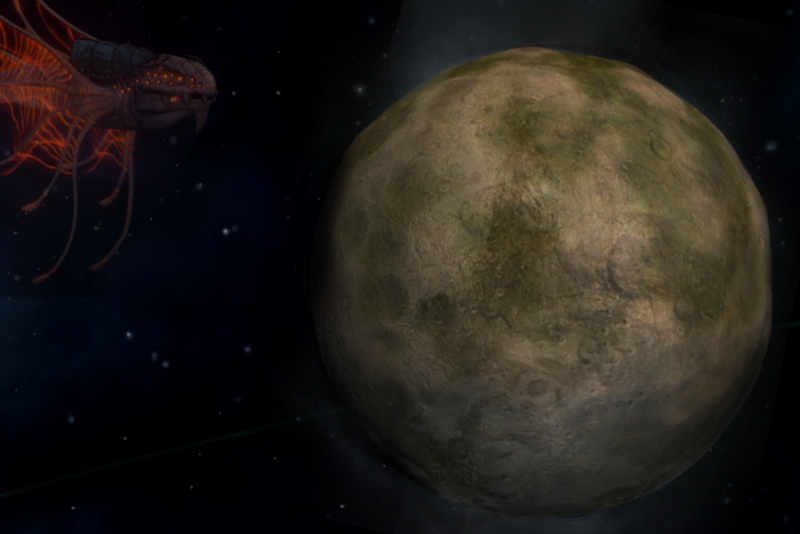 The Iferyxi government have confirmed that Bubbles, the trade league’s beloved adopted Space Amoeba, has disappeared. The alarm was raised yesterday after the juvenile female Amoeba failed to return home to Iferysia Prime after a several month stint hunting Tiyanki in unclaimed space. The Amoeba was formally adopted by the Iferyxi one year ago after accidentally imprinting on its 3rd Fleet, which had just completed its mission of destroying her mother to make way for construction of an orbital mining station. As the young Amoeba spent more time with the 3rd Fleet, she began to mirror its behaviour and became a formidable presence on the battlefield. Following a series of successful raids on Iferyxi space pirates, she was christened with her current name and became something of an unofficial mascot to the Iferyxi. Image: Zoltan One-Eye, however this name may be a misnomer as from it looks like he has three tiny little eyes. While there is no concrete evidence regarding Bubble’s current whereabouts, the Iferyxi government have confirmed her last known location was the Vogen System, near to Gorgonaut space. Image: Captain Omnomnom, leader of the Gorgons. The Iferyxi government has called on anyone with information to Shroud Fax it to their emergency ‘Bubbles Sighted’ line, details of which can be found if you close your eyes really tight and think hard about it. Image: An image of the tomb world of Desolas, taken with a telescope from a distance of 26ly. The irradiated hue of the planet is visible as a green tinge, and is noted to be so toxic even Leviathans, like the Ether Drake pictured, avoid it. A recent scientific study undertaken by the Curators, a mysterious and ancient scientific order residing aboard an isolated spacestation, has controversially declared 'dry' planetary biomes to be equally as habitable as 'wet' planetary biomes. The study was undertaken by 300,000 sapient lifeforms across 25,000 planets. Study participants were forcibly abducted from their homeworlds and involuntarily placed in a series of differing biomes every 2 years for a 20 year period. Following this, those that had survived were re-abducted and then asked to rate their experiences. The results showed that of the 14% of respondents that survived, 'dry' and 'wet' planetary biomes were deemed to be both '50% habitable.' Tomb worlds were deemed the least habitable at 10%. “It's nice to see our worlds getting the recognition they deserve. For too long dry planets have been ignored erroneously in favour of wet ones. All planets are created equal, and it goes to show we really should only be judging planets based on tile size... and we all know wet worlds tend to be smaller. ... It also helps we tend to have more natural resources which can aid the Curators in their studies, which definitely did not influence the outcome of this study, nor help the Galactic UN Ethics Committee approve the research techniques." Frozen planets, representing the so-called 'Frigid Biome' released a simple message stating they were happy the didn't get voted least habitable as per previous polls. The study had one remarkable outlier in the dataset - the tomb world of Desolas, which had a record breaking habitability of -100%. It was scored as such as all organic study participants died immediately on relocation to the planet surface, nearly all due to irradiation sickness or feral giant cockroach attack. At the time of writing, the coalition of 'Wet' planets has launched a 'Get Wet! Really Wet!' tourism campaign to promote wet world habitability.